President Obama intends to pursue LEED Certification for The White House. While the lawn will represent a challenge to achieving LEED points (short, well-groomed grass is often maintenance-intensive, and needs more water, fertilizer and herbicides than field grass), the building itself has a number of features that make it relatively energy efficient already. I was amused to read that the windows would be of particular concern. 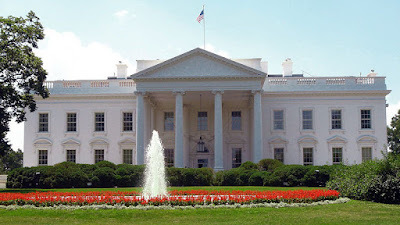 The White House, like many older buildings, has a ratio of mass vs. glass that makes the building envelope intrinsically more energy efficient than modern buildings that make extensive use of glass. Most of the tall, relatively narrow windows appear to start 30" or more above the floor, which means that they admit maximum daylight with minimum heat gain. Window treatments can help to increase energy efficiency the old-fashioned way. In summer, draperies should be closed during the day in rooms that are not being used to minimize solar gain. In winter, closing draperies (especially at night) can help keep rooms snug and warm. The White House, like many older buildings, was designed to be comfortable and healthful without central heating and air conditioning. Of course, it the building could probably benefit from retro-commissioning and new lighting design, but "if it ain't broke, don't fix it."